A wonderfully insightful blog post from Rosie, one of the volunteers who is spending some of the summer volunteering with bears in Romania. The day of travelling was long, despite the flight only being 3 hours long. The end of the trip was made stress free however knowing that the Oyster driver would be waiting with a sign upon my arrival. Once I had been greeted and met another of the volunteers we hit the road and traveled the 3 hours from Bucharest to Brasov. The journey was long but it didn’t seem it as we passed fields of sunflowers and looked at the amazing architecture. We were greeted by Razvan and the other volunteers which was lovely. We went into the flat and left our things before being taken into the town for our Oyster meal treat. The food was great and everyone was very kind and got along very well. We got back to the flat and went straight to bed. The next morning, two other new bear volunteers and I woke up and got ready to leave at 9:00am with Razvan for a tour around the bear sanctuary. Here we were told what we would be doing and also got to see some of the areas that aren’t open to the public. 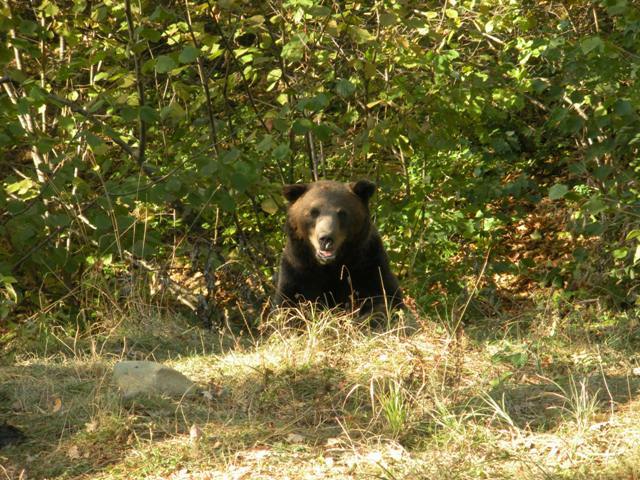 We did of course come face to face with lots of Brown Bears. We arrived just after a feed in one of the enclosures and this meant we saw about 14 bears at once. We watched them for a while and two decided to go for a swim and play fight which was very entertaining to watch. We were reminded constantly of how badly the bears were treated before they were rescued at the sanctuary and this made the first experience even more special as you could see how they were clearly in such a happy and healthy state now. We returned from the sanctuary and Razvan went through our packs with us which were waiting for us on the bedside tables along with a book about the bear sanctuary. After this we walked into town and Razvan told us everywhere that was good if we wanted to eat out or what the best things are to see around Brasov as well as the trips that were on offer to us. We then returned home and we did our own things. I personally sorted through my photographs, bought some food from the supermarket so I could cook for the week and relaxed.